It will drop below freezing tonight so try and clear all the crap off before the re-freeze. Here are some updated snow totals. Westminster is in the lead, but Ashburnham is right there. Those Oakmont towns might be the state champ today. Warmer air has held on aloft, so the change to snow is delayed. At about 5000 feet in the atmosphere temperatures are still above freezing. 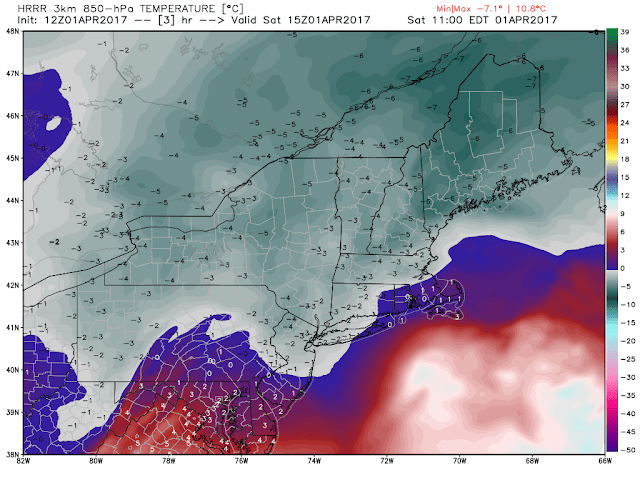 By 11 AM it will go below freezing aloft in Southern Worcester and Norfolk Counties. Some may see 1-3", but that is about it. Winds are picking up across South Coastal New England. Good Morning! Let's take a quick reset. Here is the surface analysis of this storm as of 2 AM. Theseus isn't the best looking storm I've ever seen. but I'm sure his mom thinks he is handsome. Sleet mixed with rain will continue along and south of the Pike until around 8-9 AM. Then, as the low passes by cold air will have a chance to work south changing mostly everyone over to snow to end the event. Accumulating snow in Worcester County ends around 1 PM. There is a brief window to accumulated snow between 9 AM- 1 PM. Most of Southern New England has a least a layer of ice/sleet on the road so I think we will be able to accumulate some on the roads, despite the April 1 sun. Another 1" of precipitation is still forecast to fall in Eastern Southern New England with torrential rain heading toward the Cape. Maybe up to 6" of snow in NE MA as the low moves away. Temperatures will be between 31-34. I'll be back tomorrow AM. A rough night out there, stay warm and safe. Road conditions are going downhill all across Massachusetts. Stay off the roads if you can. Short range high-resolution computer guidance is suggesting heavy rain will turn to heavy snow tomorrow morning. The snow looks to continue into the early afternoon. It will have to snow heavy to accumulate, but 2-4" is possible. We'll see if this trend continues. Ashburnham has jumped to the top of the snow leaderboard with 3.5". Here is where we stand as of 8 PM. It is snowing in Beverly, Lawrence, and but rain is being reported elsewhere in Eastern Massachusetts. Freezing rain is being reported in Fitchburg and Worcester. 8 PM temperatures show the colder air to the north. Lots of moisture to go. Winds will gust 35-40 MPH tonight in Worcester County. Winds will gust 45-55 in SE MA. If there is enough ice, this presents a big tree/power line problem tonight. Keep an eye on the glaze. If there is one the threat is low. If there is a glaze, charge your electronics. 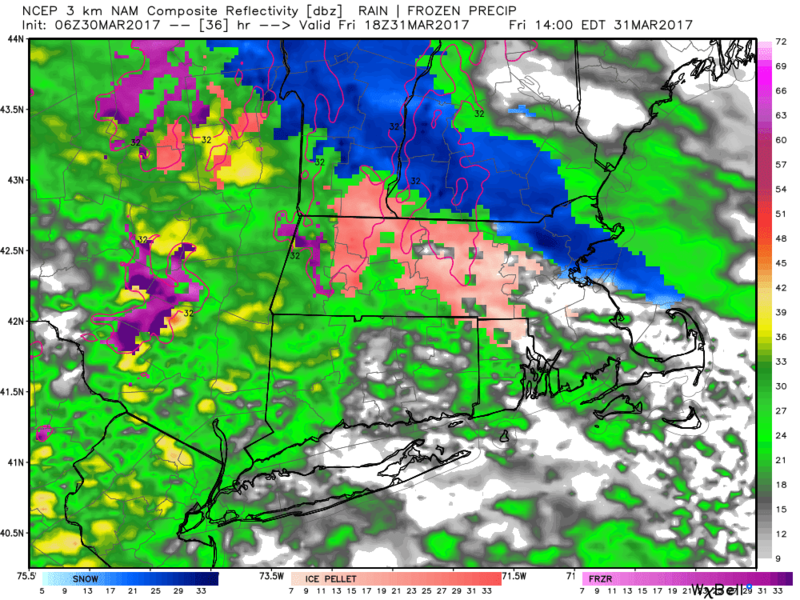 I have a growing concern of a freezing rain event in Western Worcester County and parts of Western Massachusetts. 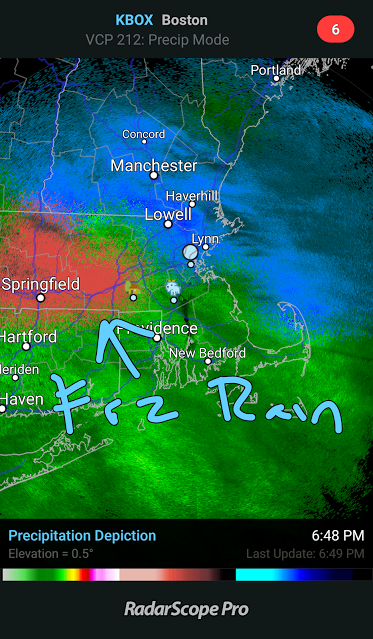 The radar is already showing this and Worcester Airport is reporting light freezing rain. 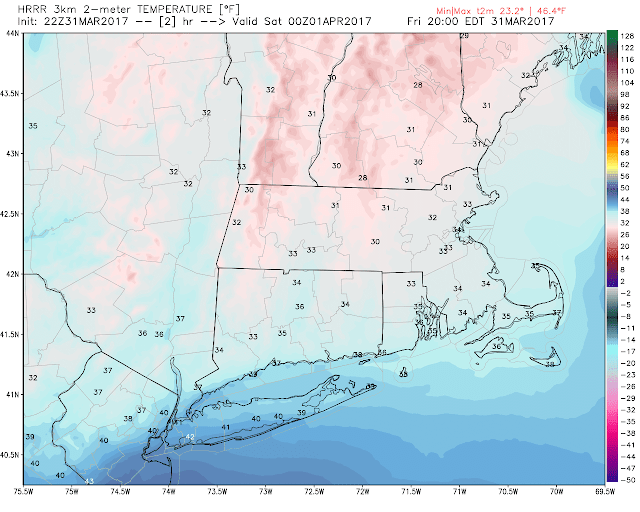 Temperatures aloft will be above freezing whole temperatures at the surface remain below 32. There will be some power outages where ice accumulates over 0.1". This makes travel a nightmare as well. Head to Providence if you want to go out to the city tonight. Some snow totals so far. These are all in Massachusetts and near Route 2, Rowe and Heath are near Florida, Massachusetts in Franklin County. The spring side of this storm system is making it a loud evening Southern Virginia and Northern North Carolina. There is a tornado watch in this area. There are two tornado warnings at the moment. 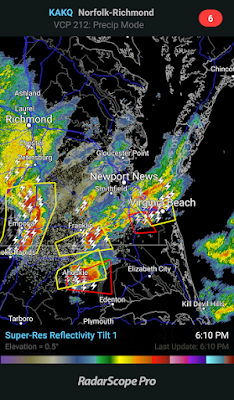 One is in Northeast North Carolina and the other is moving right towards Virginia Beach. Temperatures are in the 70's in these areas, helping to fuel these strong storms. The atmosphere is primed to produce moisture tonight. The new surface low will start to form soon off the Jersey Shore. When the sun goes down, we won't be singing. Southern Worcester County and Coastal NE MA are now under a *Winter Storm Warning*. Heavy sleet and snow are likely tonight north of a Brockton-Providence-Hartford line. Here is the storm shaping up on satellite. The Weather Channel has dubbed this Winter Storm Theseus. I guess I'll use it, but it's definitely not as cool as Stella. The precipitation was mostly wet and not white this morning and afternoon in lower elevations thanks to a low intensity and marginal temperatures. Tonight, the low intensifies south of New England. Temperatures will hover right around 30-32 tonight. Precipitation will be all over the map with sleet, snow, and freezing rain all falling from the night sky. When the precipitation is heaviest it will fall as snow, sleet, or both. 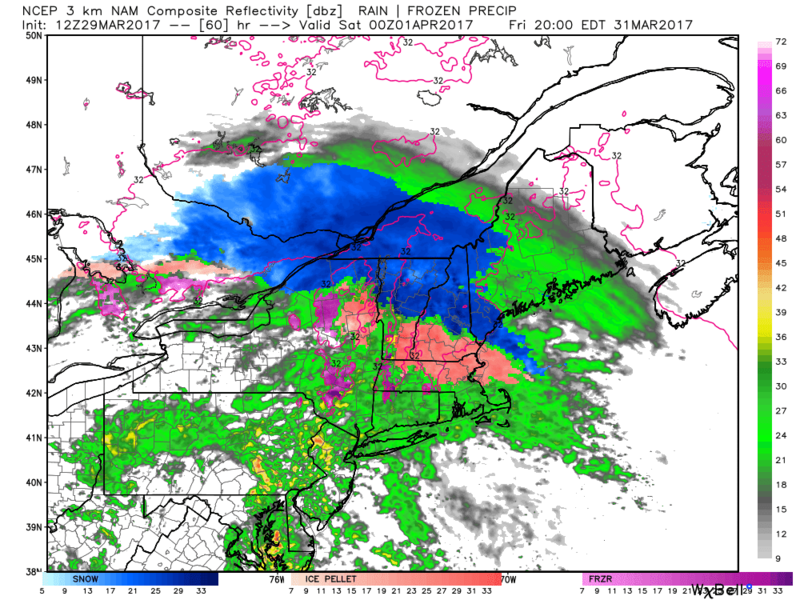 When precipitation lessens in intensity it will be mostly freezing rain/rain. As you can imagine that makes accumulation tough. Some snow will fall on untreated roads but most of it will accumulate as a cement slop on grass and walkways. Where it stays all snow watch out. A *Winter Storm Warning* is posted north of the Pike and a*Winter Weather Advisory* is posted for some counties south of it. Light precipitation will continue off/on until early this afternoon. Temperatures will be in the low to mid 30's. Snow, sleet, and eventually rain is on its way. This model sure is showing a colder scenario, so north of the Pike 6+" is definitely on the table. Total snow forecast is up a little, but it looks like mostly sleet in the Providence to Worcester corridor. The storm is trending colder tonight so travel will be slick later on. The National Weather Service in Taunton has issued a *Winter Storm Watch* for locations north of the Mass Pike. The areas in the watch are the ones who are most likely to see 6+" of snow. Near the coast and south of the Pike, warmer air aloft will change frozen precipitation to rain. Some of these areas, like Hampden, Southern Worcester, and Norfolk counties will likely have a Winter Weather Advisory posted later today. Let's time this storm out so you know what to expect and when. Mostly sunny with temperatures near 50, Winds will be light and clouds will begin to increase late this afternoon as a warm front associated with our storm system creeps northward. Increasing clouds with light winds. Temperatures by daybreak will be near 30 in the Blackstone Valley. Temperatures are in the mid to upper 20s in Northern MA while it will be a bit warmer south of the Pike in SE MA/RI. 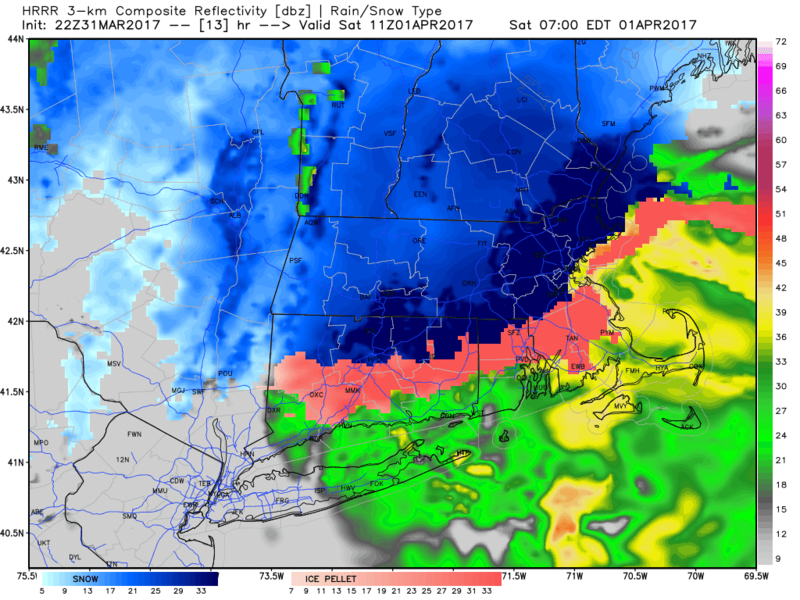 Any precipitation that falls before 8 AM tomorrow morning will be light in Central and Eastern Southern New England (CMass, EMass, RI). Sidewalks and side roads may be a bit slick in Western MA/CT as people head to work/school, but main roads should be okay. After 8 AM the precipitation will increase in intensity. This is not a well-organized radar image. The precipitation will be scattered tomorrow morning. I would not cancel any plans before noon time. The storm system will not be well organized so the snow will struggle to stick in Southern Worcester County and Eastern Massachusetts through lunchtime. Between 2-5 PM sleet and freezing rain will be the biggest problem in Worcester County, while a band of snow will set up in NE MA. IF snow is to fall in Southern Worcester County, it will be between 11 AM - 3 PM. A quick 1-3" could fall. Given temperatures right around freezing and the strength of the spring sun I would bet low on snow. By 8 PM sleet/freezing rain will be the dominant precipitation type in Eastern MA as well. After 10 PM, locations South of the Pike will go over to all rain. 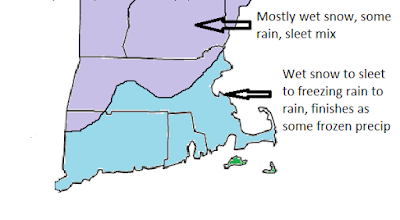 One exception could be Western Worcester County/NE CT where freezing rain is likely. Heavy rain will fall after midnight as the low passes south of the region through 7-8 AM. 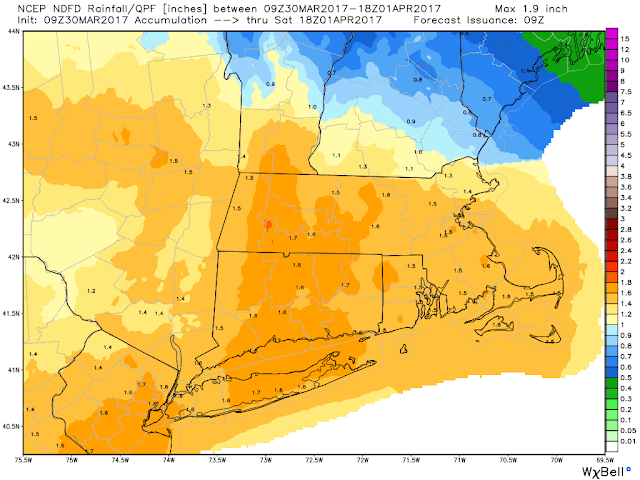 In all, over 2" of precipitation will fall. So basically 1-3" north and west of 95 to the Pike, then 3-6" from the Pike to MA-NH/VT border. Some remnant precipitation will be around Saturday afternoon as the low pulls away. 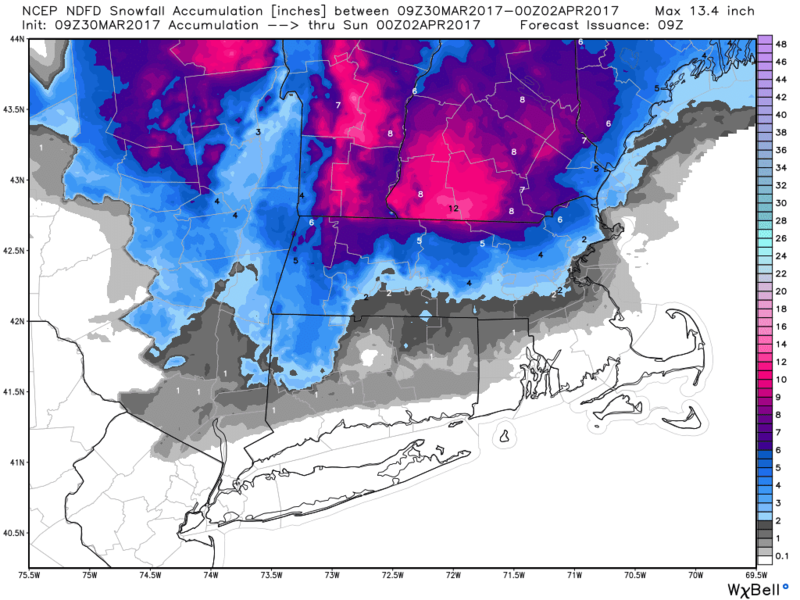 There are lots of red flags for snow in Southern New England with this storm, which is typical since it is almost April. The snow will be heavy and wet in Northern MA so some tree limb damage is possible. On Sunday, March 30, 1997, Southern New Englanders woke up feeling pretty good. It was Easter Sunday and temperatures were forecast to be 6-12 degrees above average. The winter was rather tame to date and it sure looked like Spring was here to stay. Although the Red Sox had gone 79 years without a World Series title, they had a hot shot rookie SS with a quirky batting stance taking over who would inspire thousands of kids to be "Nomar" in their backyards. Easter 97 sure seemed like a good day to practice the Nomar toe tap and take a few swings with the family. 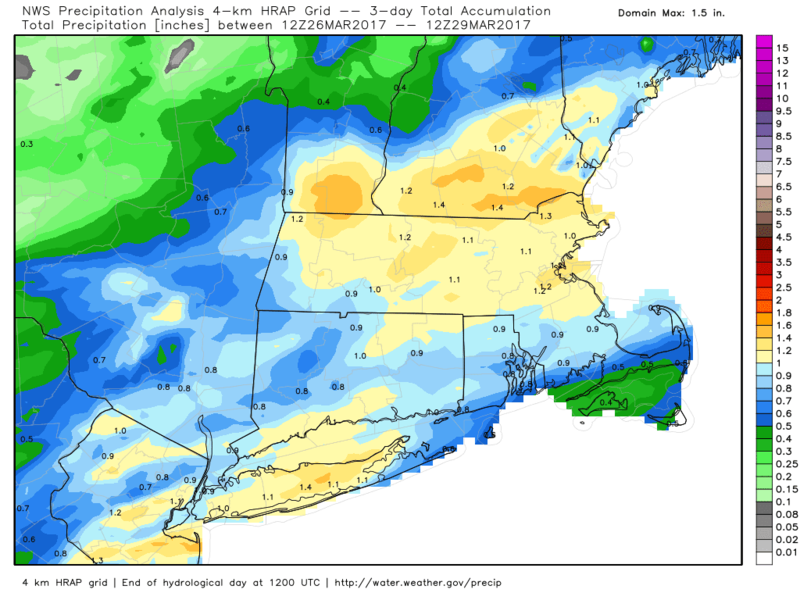 The early to mid 90's have some of the most extreme seasonal snow totals in Boston and Worcester on record so we were going to celebrate a fairly normal winter. One explanation for the extreme snowfall totals in this time period is the global effect of the Mt. Pinatubo volcanic eruption in 1991. The volcano spewed so much dust, ash, and debris into the equatorial atmosphere that global atmospheric circulation patterns were impacted. There was so much remnant debris in the atmosphere that it slowed down weather patterns. So once a pattern locked into place it stayed there. We saw that in 2015 as well as 1993, 1994, and 1996. I'm not saying Pinatubo had anything to do with this storm; my point is we had a earned the right to a nice normal spring. But the weather is what it is and Mother Nature dropped one of the greatest snowstorms in our region's history on us in Spring. The weather chart on 3-30-1997 isn't all that ominous. Even a trained meteorologist would have trouble believing big mischief was coming from a rather innocent looking surface chart. The general flow into New England was out of the Southwest. Cold air lurked north of the boundary in Southern Canada, associated with high pressure. One low that would eventually deepen South of New England is near the Minnesota/Manitoba border in this image. The other was moving across the South. By 8 AM the next day the two lows were combining to form one near the VA/MD coast. Cold air began to filter south from Canada on Monday, March 31, 1997. Rain began to fall from Philadelphia to Maine. The storm began to get stronger later Monday morning and into Monday afternoon. As this happened, cold air was drawn from the north and rain began to change to snow. Here is a still shot of a Channel 5 forecast showing the extreme temperature gradient present in the Eastern US. The storm would stall offshore for a few hours while a band of heavy snow sat in Eastern Massachusetts. 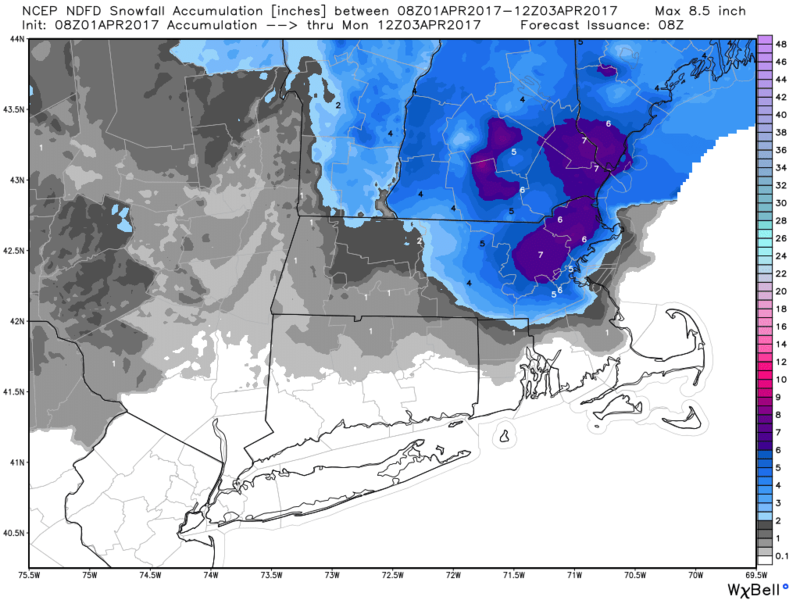 The low would weaken and drift to the southeast later on Tuesday, April 1 but not before snow lingered into the early afternoon in Eastern MA. One week later on April 7 max temperatures were in the 70's. The snowstorm dropped the largest snowfall in Worcester until it was surpassed by the January 2015 blizzard (33.0" vs 34.5"). 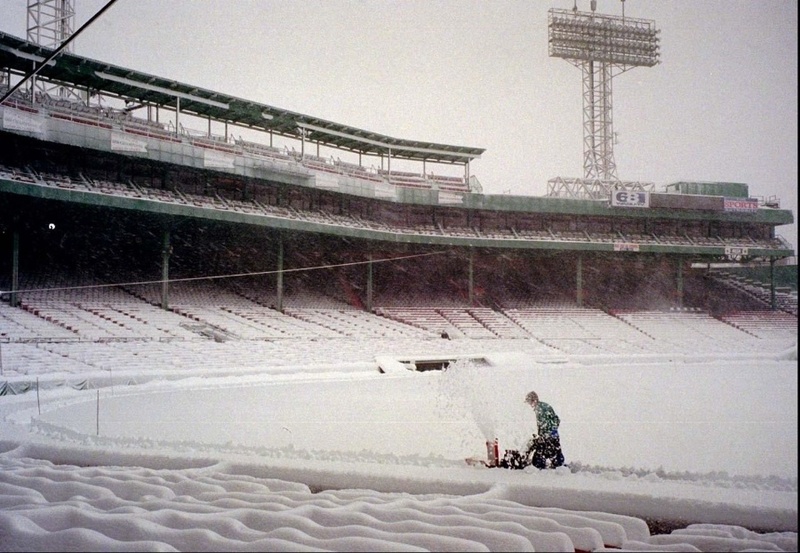 In Boston, the storm is the greatest 24-hour snowfall and 4th largest snow total on record with 25.4". 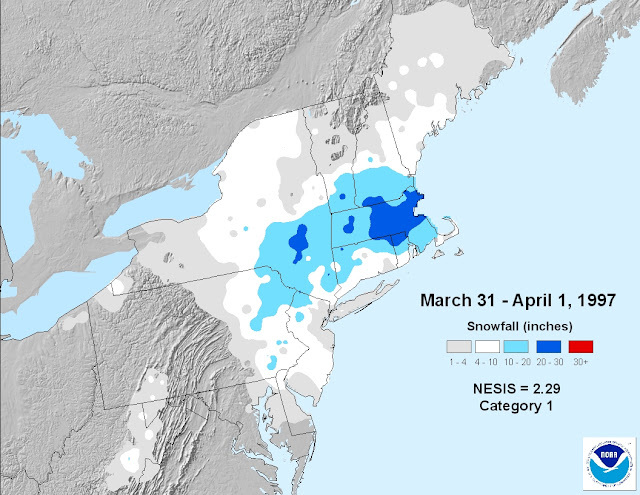 The 22.4" that fell on April 1st makes April 1997 the snowiest on record for the capital of New England. 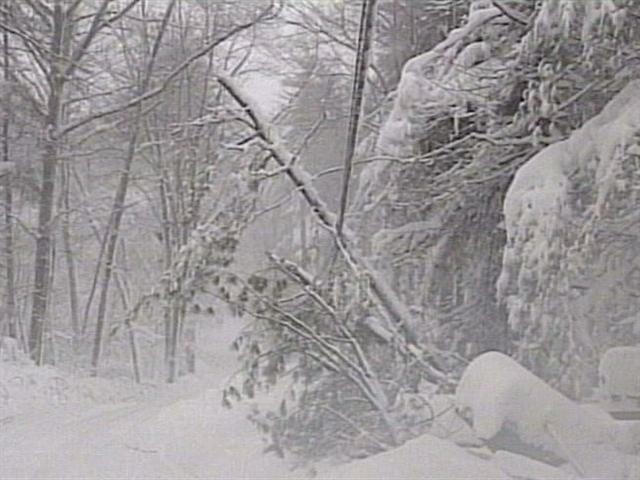 The impact of the heavy wet snow on tree limbs led to hundreds of thousands of power outages. At the height of the storm, nearly 700,000 people were without power. The snow fell at rates of 3"/hr late Monday night into Tuesday morning. Public workers and snow removal contractors could not keep up with the relentless snow and many streets became impassable. Schools closed for 2-3 days after the storm because most of the region was completely shut down on 4/1. Despite temperatures in the upper 40's in the days after the storm, the heavy, wet nature of the snow made it very difficult to move. Residents became upset with the slow response to the storm. The Red Sox were able to host the home opener 10 days later against the Seattle Mariners (a 5-3 loss). 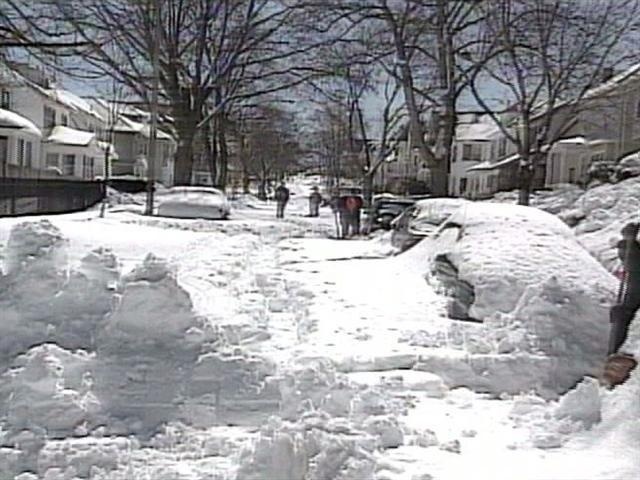 Spring came, the flowers bloomed, and the April Fools Day Blizzard of 1997 became a memory. I rate this as the second most important storm on my journey to becoming a meteorologist. Hurricane Edouard in September 1996 made me a weather weenie and this blizzard cemented my fate. It took until January 2015 before I saw snow this high from a single storm again. As cool as this storm was, I'm sure many of you hope to never see one like it again. ICYMI, frozen precipitation is in the forecast for Friday and Saturday. 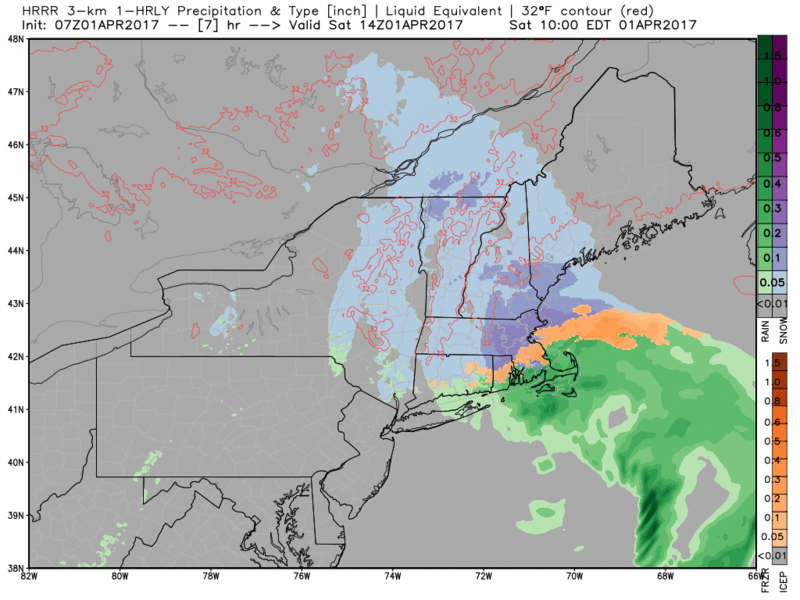 A large storm system will move south of New England Friday-Saturday bringing a plethora of precipitation types. Some will see heavy rain, some will see heavy snow, some will see freezing rain, and some will see all of the above. This is a traditional early spring nor'easter that will feature lots of precipitation, marginal temperatures, and a strengthening low to our south. Let's time the storm out and discuss when the various p-types could impact your backyard. Over 1" of rain has fallen in the last 3 days across parts of Southern New England. This is a good thing for our drought situation because the ground is able to effectively absorb moisture this time of year. There might be a few showers on the Cape today but the region is generally dry until Friday. Temperatures this afternoon will max around 50 as a developing NW wind dries out the lower atmosphere. The sky will be mostly gray with only a few breaks of sun. The clouds will break tonight and temperatures will fall into the mid 20's by daybreak. Here is the current water vapor satellite. Our next storm system is in the central US. Unfortunately, this storm system produced severe weather yesterday and several storm chasers died in a car accident while trying to catch up to a reported tornado on the ground. It's a sad day for the weather community, especially the storm chasing community. More severe weather is likely in the Southern Mississippi Valley and parts of the Plains. High pressure will be in control tomorrow so skies will be mostly sunny with max temperatures around 50. So far this week temperatures have trended colder than forecast but with the sunshine tomorrow and winds out of the northwest at 5-10 MPH the upper 40's/low 50's seems reasonable. Low temperatures Friday AM are expected to be right around 32, right when the precipitation begins. Parts of Western MA/CT will see snow begin around daybreak. The intensity of the snow will determine its ability to stick to the roads. This band of precipitation will move into Central/Eastern Southern New England after 8 AM. South of the Pike this will quickly go over to a mix of sleet, freezing rain, rain, and snow. Spring snow is generally heavy and wet so that is a concern, but of greater concern is the threat of freezing rain. As of 8 PM Friday night I think all of New England north of the Pike will see some sort of frozen precipitation. The low will be re-developing south of New England at this time. The wind will shift to the east so SE MA/RI/E CT will warm well above freezing. The precipitation will exit by late Saturday AM/early PM. The low will be large, but not very strong. Still, winds will gust 30-50 MPH in SE MA. There may be some coastal concerns thanks to the long duration and large fetch. 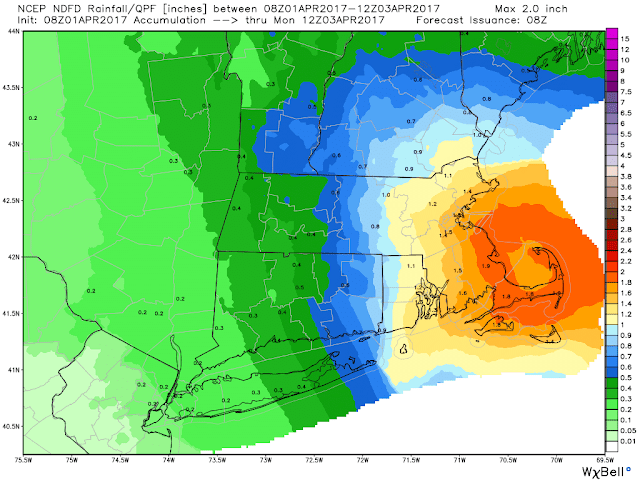 Beach erosion and minor coastal flooding are possible. So in general, this is what I expect. 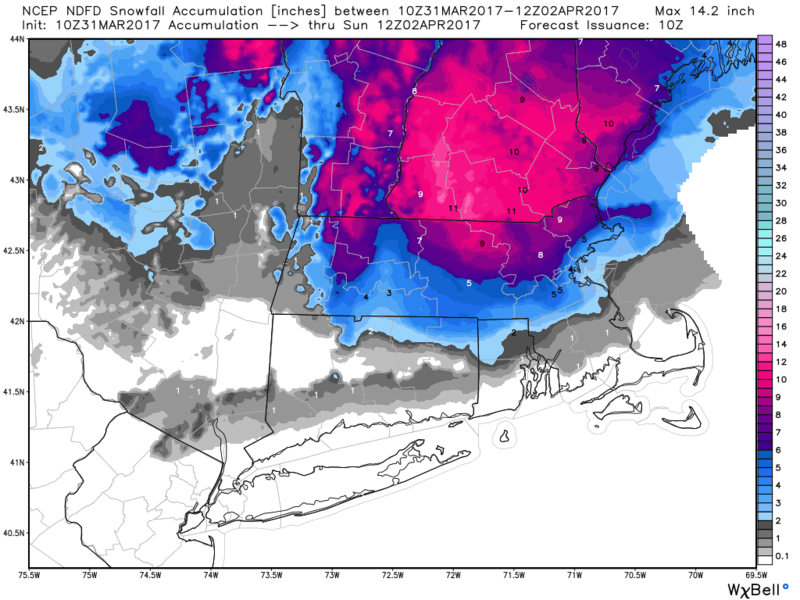 For Southern New England, I am not expecting major snow totals. It's not impossible (more on that later) nor unprecedented but I think that is more likely for Central New England. 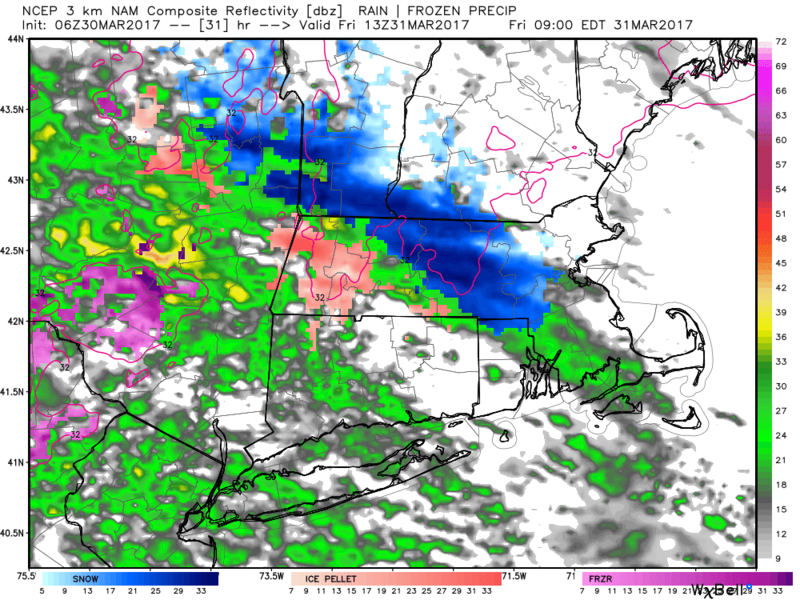 I am much more concerned about the potential for damaging freezing rain in Worcester County and the Berkshires. Long for an update tomorrow AM. 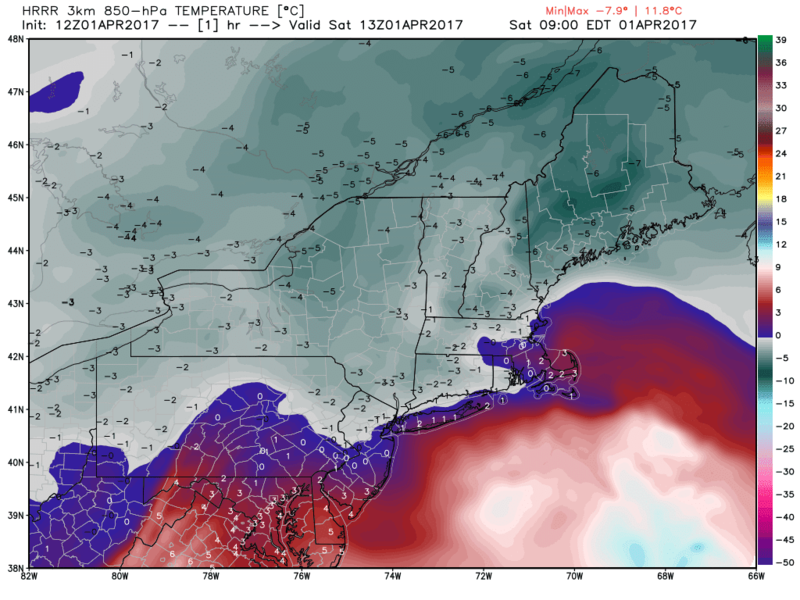 Minimal Snow Threat Saturday in SNE, Sunday?? You Didn't Really Think Winter Was Over, Did You?